Clear your desk, move all your files on your desktop to one folder, move your thousand emails in your inbox in to one folder. You will immediately feel less overwhelmed with a clear desk and inbox (even if the reality is that you have just shifted stuff from one place to another). 2. 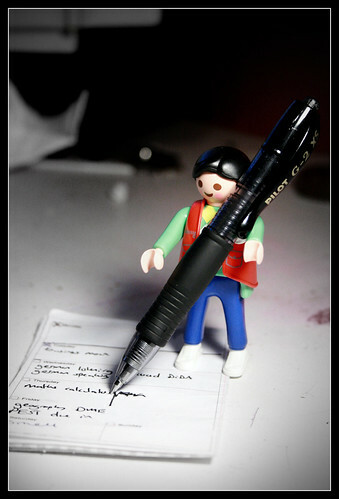 Use paper for your lists – don’t use outlook, fancy online tools etc. Lists and the use of lists are central to the GTD methodology. I have experimented with literally hundreds of online to do management systems, excel spreadsheet designs, outlook categories etc. What have I learned from this? Paper is the absolute best place to keep your lists. It is non-linear. Sure it is fun to play around with the latest system but there is bound to be something that it doesn’t do that will mean you just look for another system. This doesn’t actually need to be an inbox; it just needs to be a designated place where you put all of your ‘stuff’. Write it on a Post-it note and stick it on your monitor and your inbox. Make it your mantra. Whenever you designate time to processing, say it for everything that you pick up to deal with. 5. The Waiting for list is very powerful. This is especially true if you are delegating as much as possible. You want to do less don’t you? Then you should delegate as much as possible. The unfortunate nature of human beings is that they don’t always do what you ask them to. Keep a waiting for list so you can keep on top of everything you are expecting someone else to do. Simply initials of delegate, date delegated and task are the only things you need to record. Cross it off when it is done. I find that keeping the date delegated is useful when chasing people up. 6. Set up your filing system before you start and keep it simple. For online filing just use an archive dump folder as search tools are good enough. For physical filing David Allen suggests a simple A-Z system. Personally I find myself filing physical stuff less and less so my existing system for papers works just fine. For my electronic documents search tools make just archiving everything the easiest thing to do by a mile. 7. Resist the temptation to read too much and try out every single new to-do list application etc. for your system. That’s part of the reason this list is about keeping things simple. You can spend weeks of your life reading up how to ‘Sharpen your Saw’ and get your system as perfect as possible. The reality is that once you know the principles the best thing you can do is simple to apply them and start getting things done. Establish a filing system for your emails and keep it simple. That way when you have an email you will quickly be able to put it where it needs to go. Base it on the mantra, and remember if your system is simple and easy to use, then you are more likely to use it. a) Do It – once you’ve done with the email archive it. Have just one or few archive folder for your emails rather than loads of folders for different things. You can use the wide variety of search tool to find emails in the future quite easily. b) Defer it – pop it in a ‘Follow up’ folder and make a note of it on your next actions list – easy! c) Delegate it – pop it into a ‘Hold’ or ‘Waiting for’ folder. You could of course set up some fancy rules to do this for you when you delegate someone something by email. d) Delete it – If something is for information only or of no relevance then delete it. Or you could actually just archive it just in case. Either way if it no longer serves any purpose then get it out of your inbox and move on. Remember every time you re-read an email you waste time. 9. Process your email in batches at set times rather than keep checking throughout the day. You’ll find that if you set aside a time to go through all of your emails in one go then you are more likely to stick to your GTD mantra and whizz through them. I actually rather sadly enjoy seeing how quickly I can get my inbox to zero (and get out of there!). If you spend your whole time with one eye on your inbox then you’ll be constantly distracted and unproductive. Switch off email popups etc and focus. 10. Make sure you do the weekly review. I’ll admit it; this is by far the weakest part of my implementation. Setting aside structured time to do my weekly review is sadly lacking. This is stupid of me as I know how valuable it can be. I do find that I ‘can’t be bothered’ as much on a Friday so often now find that I do an ‘informal’ weekly review on a Monday as I set out my tasks for the week. The fact is when you do a weekly review and go through everything and eliminate as much as possible you have a much better grasp of what you have to do and how you’ll get it done. Let me know how you get on or if I’ve missed anything in the comments below! Do you use GTD? How simple is your implementation? I hope you enjoyed my post. I’d love to hear your comments below or get a Digg or Stumble! A mobile version and iCal are available too. These are a few concepts and ideas for Future Email Program. Thought it will be useful. I’m so disorganized (um… maybe I should just come out and say lazy) that I started reading GTD, but it seemed like too much work and haven’t picked it up since. I hate reading about systems. I just want someone to take me through each step… not read a book about it. @ pachuvachuva – thanks. Maybe if you are overwhelmed with task you need to sit down and ask yourself what really is important, or really needs doing and eliminate the rest. I find deleting things off my to do list very satisfying! @ Cristina – thanks. I agree GTD can seem like too much hard work, but I think the overall concepts are worth looking at. I’m a bit sad an like reading about systems! I find GTD is easier once you get over the intial ‘Getting Things Sorted’ element! Maybe getting organized is you Lifestyle Project? Let me know! I’m glad you say you like information given to you as a easy-to-read post, I have something up my sleeve for that. Tune in for more news soon! WOW! Thanks for dropping by and reading my blog everyone. Seems I was on the frontpage of WordPress.com today and that massively spiked my hit rate! I really like it when people leave comments and subscribe too. I found out about your post (and your blog) via Twitter. BTW, thanks for the follow. I’ve reciprocated. We’ll be in touch! Hey Chris – I just stumbled this post. I need some help and perhaps others do, too. @juliemarg – great thanks very much. Good luck keeping it simple with GTD. That’s a really great list. I was a huge user of GTD when I was working in the corporate world, but I also find a different version of it very useful for the SAHM. I think it would be very interesting to see if there are other SAHMs who use this system too, because it lends itself very easily to the working world and those who do work are more likely to WANT to do it (thus, the job, etc.) but I know for a fact that it can be very useful for people who do not work outside the home (because we all know by now that raising kids is HARD WORK).